Complete excavating, hauling and dirt work services for the Missouri counties of Barry, Christian, Douglas, Greene, Lawrence, Stone, Taney and Webster. We have topsoil, gravel, river rock, and fill and are a licensed septic system installer. Check out our services, then call us for fast, friendly, prompt service. If it has to do with moving dirt or rock, we can help. We have the equipment needed to ensure the job gets done efficiently and to specifications. 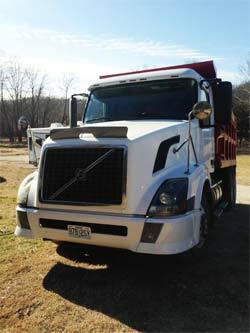 If you need dump truck services or have a job that requires a loader, a bulldozer or a backhoe we are here to help. Below is a list of some of the services we offer. We are also a licensed septic installer and are fully insured. If your project is not in the below list, give us a call and we will discuss how we can help. Need some dirt moved? You've come to the right place. We dig basements, build building pads, clear fence rows, lots and land and can even build you that new driveway you've been thinking about. We have good equipment and know how to use it. Call us today and let's get that project finished. Whether you need fill dirt for a project, topsoil for a new lawn or gravel hauled for your driveway, we can help. We have access to gravel, river rock, fill dirt, topsoil and limestone. Not sure just what you need? Call us and we can help determine what will work best for you. We offer a full backhoe service. We can dig and install water and electrical lines or fix a driveway culvert. We also dig footings and offer backfilling services. If you need a backhoe and operator, give us a call and we will be glad to talk with you. We are a full service excavating contractor. With operators experienced in excavation work running our bulldozer, backhoe, loader or dump truck. We can help you do everything from dig basements, site excavation, driveway building, ditch diiging or trench digging to backfilling a basement. 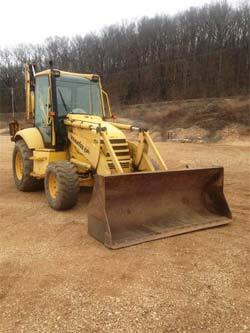 Our dozer operator can help with clearing land or clearing lots. DCB can provide a clear right of way or clear driveway for that new property. 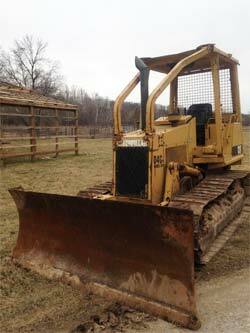 We offer complete dozer service and would be glad to talk to you about your needs. DCB Construction works with all types of dump truck hauling. Dirt moving is a specialty and in addition we have full access to river rock, fill dirt, topsoil and gravel. If you need to add gravel or rock to a driveway, fill a low spot, or put top soil on a new lawn give us a call. Septic system construction is something that DCB Construction is licensed for. We know how to dig a septic system and install septic lines to build septic sytems that work. Don't make the mistake of hiring someone who does not understand the details of installing a septic system or who is unlicensed. We will be glad to talk to you and make arrangements to look at your site. When it comes to trenching or digging ditches we can install underground electrical, dig footings or install water line. Again we have the equipment and experience we need to get the job done. DCB Construction, LLC is owned and operated by Dave Boesigir and is dedicated to offering you the excavating and hauling services you need for a fair and reasonable price. We pride ourselves on providing our customers services they can count on. Located just outside of Crane, MO we are able to service a large portion of southwest Missouri. We are always glad to talk with you about your needs and will do our best to help you get the job done. Give us a call so we can discuss your needs. We cover a large service area and would be glad to speak with you about your needs and the options for meeting them. The below map shows our normal operating area. However, for larger jobs or for special projects, we do work outside the below area. The quickest and most efficient method of contacting us is to simply give us a call. In most cases we will answer and you will be able to talk to a real, live person who understands our services and what we do. In the few instances where we are on the phone or not able to answer, leave us a message. We will get back to you as soon as we can. For those of you who prefer to contact us electronically, you can send DCB Construction an email. Just include your contact info and what you would like to discuss.